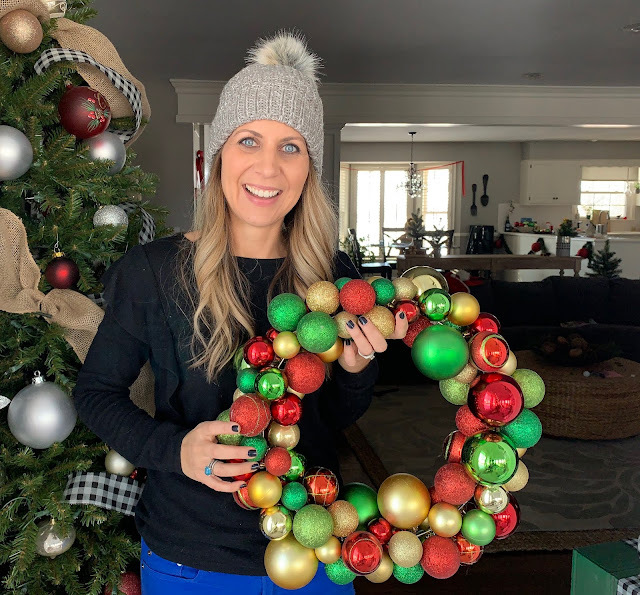 I stick to traditional colors for my outdoor decor, and I used these wreaths to add color to my urns. Since they were on their last leg, I decided to recreate them, but this time I used materials of a slightly higher quality in hopes that they would hold up better through the years. 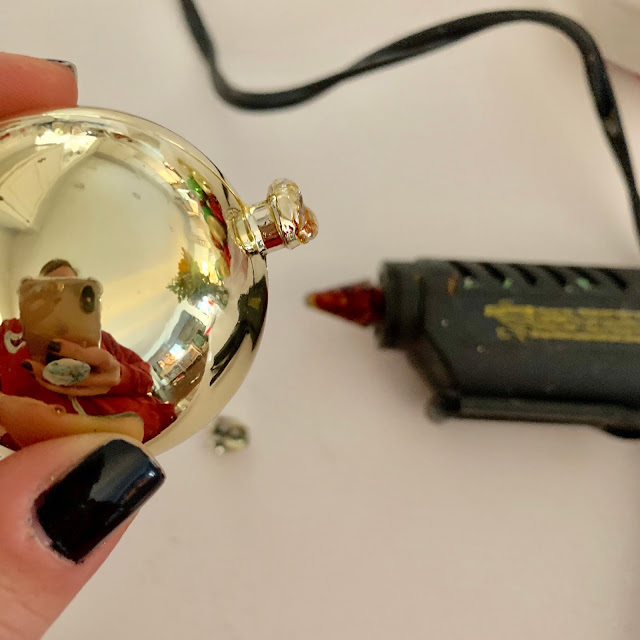 The first thing you will want to do is glue all of the ornament caps onto the ornaments. This sounds tedious, and it is, but it honestly didn't take as long as I was anticipating. And after watching my ornaments pop off the wreath each year, this step is going to pay off in the long run! 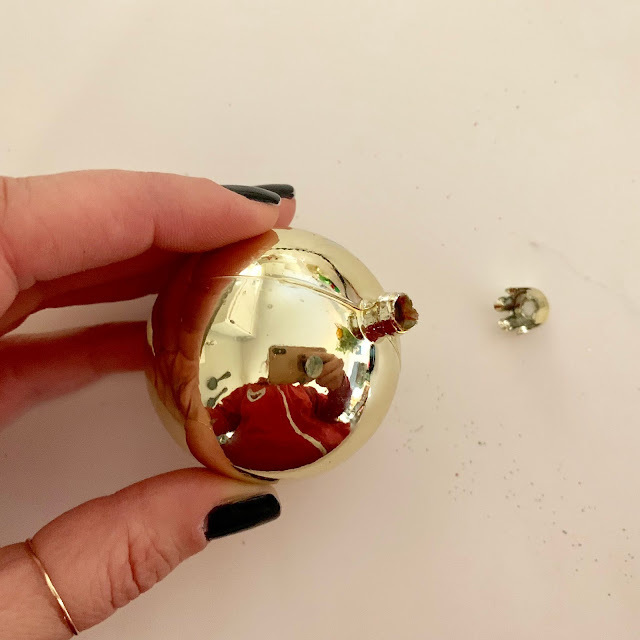 If your ornaments are already glued, then you can shout a big hallelujah because you just got to skip a big step in this process! Mine were not secured, so I popped each cap off and re-secured it with hot glue. Start by wrapping the craft wire around the metal hoop and securing the end. Allow yourself enough wire to work with, I used about a 2-3 ft strand. 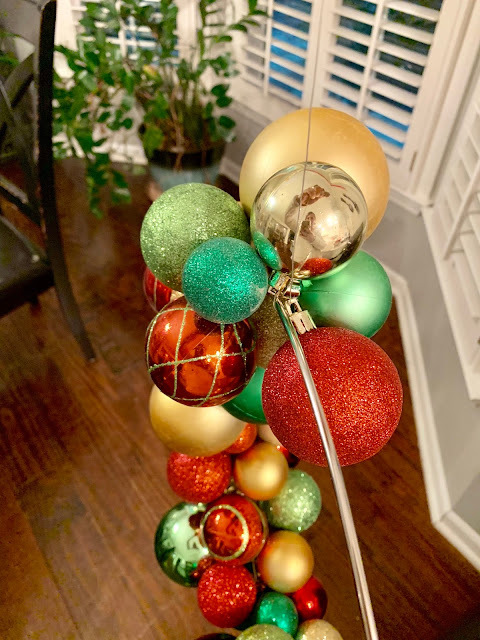 Choose a few ornaments and thread them onto the wire. 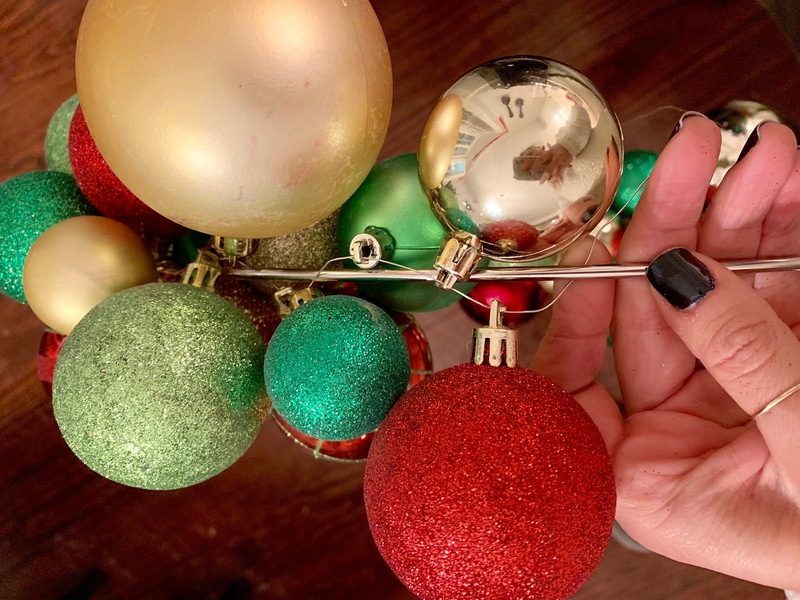 Wrap the wire around the hoop, dispersing the ornaments so they are also wrapping around the wire. Add a few more ornaments to the craft wire, then wrap it around the hoop again. 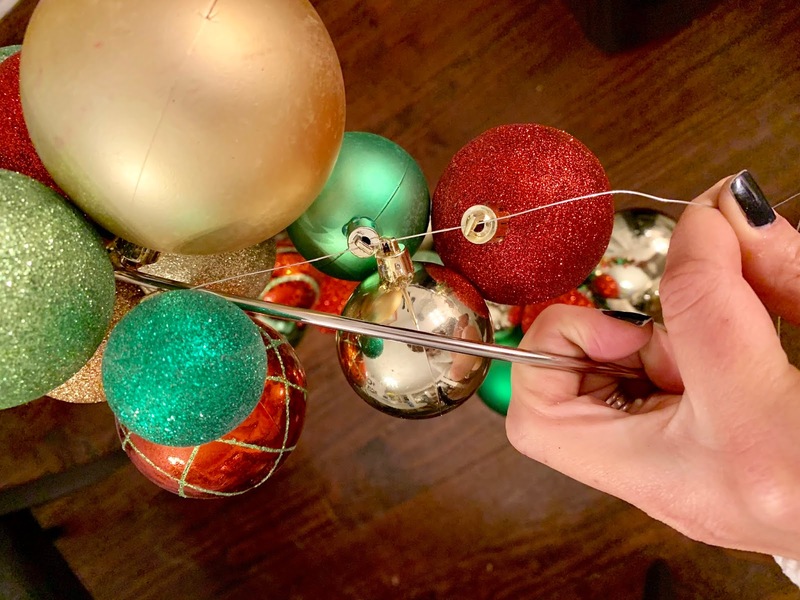 Pull the wire tight against the hoop to secure the ornaments in place. Continue this process over and over and over again until your wreath is full! If you run out of wire, just secure the end and start again with a new piece of wire. Take note of the colors and sizes you are choosing so you don't get too many of the same grouped together. 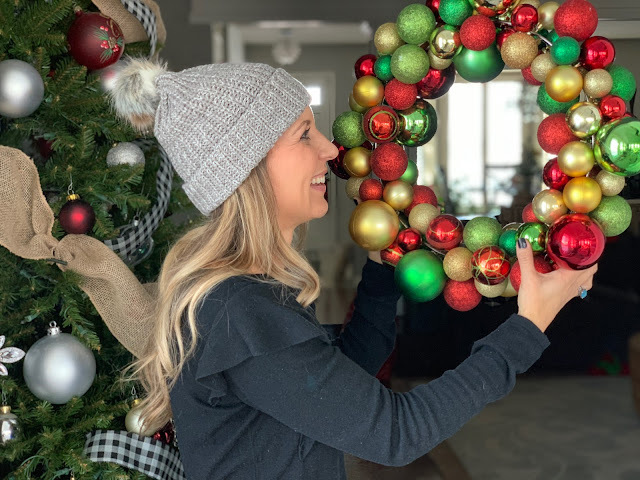 I chose my colors and sizes randomly because that's how I like my wreath to look, but I was mindful to choose different colors to avoid having one large clump of a certain color or size. When you are all finished, wrap the wire around the hoop several times and secure the end. 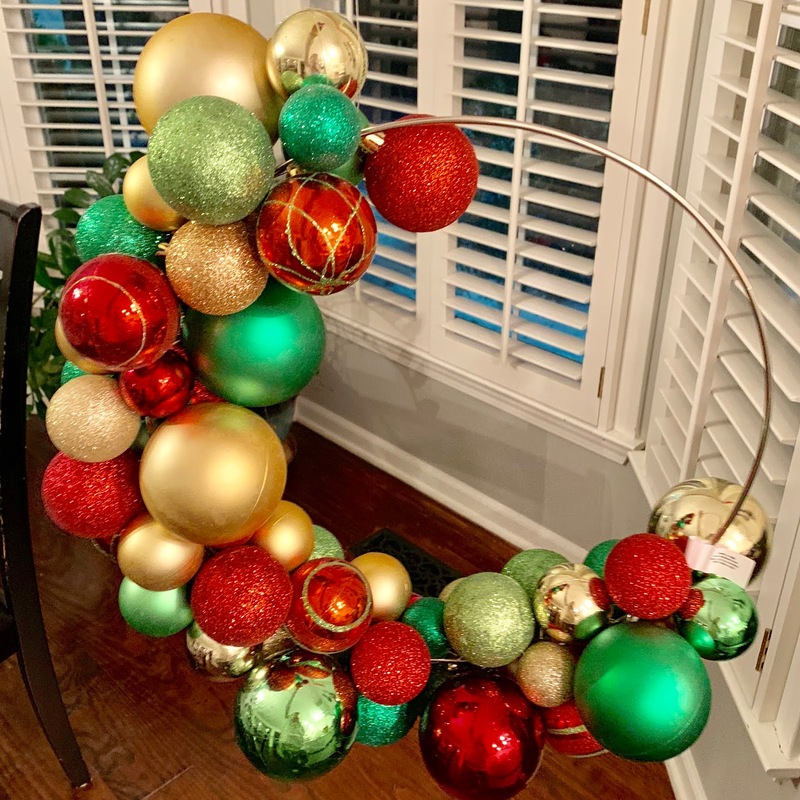 You could even add a dab of hot glue to ensure it won't come unraveled. And there you have it! You could do any color combinations imaginable! Snag some ornaments during the after-Christmas sales and you can make these for dirt cheap!